COLOR(S):White, cream, reddish brown, golden, red, grizzle, or black and tan. The Saluki is a breed of dogs known for speed, stamina and endurance. It resembles the Azawakh or Sloughi, which were commonly known as the Royal dogs of Egypt. Until the designation of Sloughi as a breed, it was commonly mixed with Sloughis in England and some other European countries. Salukis are perhaps one of the oldest known breeds of domesticated dog. This odor-free dog is easy to groom. The longer-haired part of the dog should be brushed and combed. It is an average shedder. Salukis come in two varieties - the Smooth, having short silky hair all over their bodies, and the feathered, with long silky fringes on the ears, tail and rear of the limbs. Prone to cancer. Other possible health concerns include ehrlichiosis, epilepsy, hemangiosarcoma, hypothyroidism, sensitivity to anesthesia, genetic eye diseases and sunburns, especially on the nose. They need the opportunity to run free in open ground and also need long daily walks. They would make a great jogging companion. Puppies need to be socialized from a very young age as the breed is generally aloof or shy. 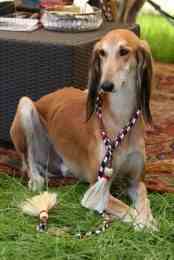 Saluki need room to roam, and a very high fenced yard (they have exceptional jumping skills). The Saluki loves comfort and should have a soft bed out of drafts. The best owner for this breed would be an active family living in the suburbs or the country. Learning Rate: Medium - Low. They are easily distracted while training. Obedience - Medium. Problem Solving - Medium.